Building upon several decades of collaboration, WPI and the Natick Soldier Research, Development, & Engineering Center (NSRDEC) look to a future of jointly developing innovations to improve the effectiveness and readiness of America’s warfighters. Researchers at WPI and NSRDEC are working together to pursue advances in fire science, data and security, aerospace engineering, manufacturing, and robotics. Working with NSRDEC allows WPI to form active research teams around our shared areas of expertise, and address the problems that need solving. 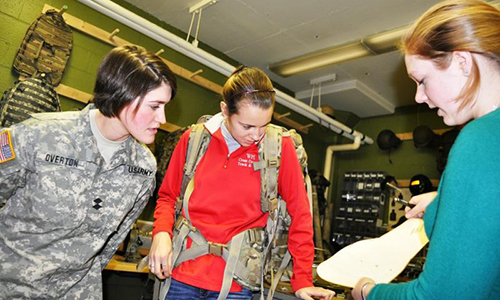 WPI offers training and on-site programming for NSRDEC civilians, scientists, and engineers in various competency areas. In addition, more than 10 percent of NSRDEC’s scientific population is the product of WPI’s strong pipeline in STEM disciplines. Presenters from both WPI and NSRDEC come together so researchers from both institutions can identify potential collaborations that can make soldiers’ lives easier, healthier, and safer. The Center for Holographic Studies and Laser micro-mechaTronics (CHSLT) at WPI is currently working with NSRDEC on two research projects aimed at protecting soldiers from hazards that can result in serious bodily and brain injuries and damage to the visual and auditory systems. In particular, CHSLT is seeking to leverage knowledge gained from its laboratory studies and new technologies to develop more effective smart technologies for protecting the eyes and ears, as well as new ways of designing and testing advanced helmets and wearable protection plates, including the use of quantitative ultra-high-speed imaging. The benefits of this work will include the development of unique components and materials, as well as workforce development. Whether it’s collaborating on fire protection engineering research, facilitating on-site graduate degree programs, or providing a pipeline of talent, WPI is helping the U.S. Army Soldier Research, Development & Engineering Center (NSRDEC) solve an important real-world problem: optimizing the performance of soldiers on the battlefield. WPI is uniquely postured because they have this ability to look at real world problems and help us solve them. Partnering with WPI has led to innovations over the years such as an evaporative cooling vest for soldiers. The vest is now being used by Army air and armored vehicle crews. Another example, is a student team that designed a containerized kitchen with the goal of getting it ready for the manufacturing process. For more information about other opportunities for collaboration, contact Michael Wright in the Research Solutions Institute.